Someone will come along and crack this nut. Here’s my color analysis using Adobe CS6 and its “invert” function. Adobe CS6 interprets the inverse colors of black and blue as white and gold. Here’s an illustration using CS6. The sample white and gold dress on the left turns black and blue when using the CS6 invert function. The actual retail version of the dress under debate, on the right, which is only available in black and blue, turns white and gold under inversion. 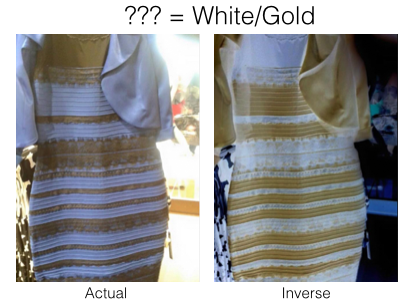 Using the same invert function on the original photo under debate reveals the true colors of the dress. CS6 cannot be fooled. If the dress were truly white and gold, the CS6 inverse result would be black and blue, as illustrated above (left). It clearly is not. CS6 says the dress in the original photo is black and blue.